These Spring Art Center ideas will help your preschool artists create some Spring inspired art. So often we give children the same bright colored art materials, those “8 basic colors” to use all year long. Spring is a great time to change it up and introduce some pastels. These ideas work well in an open-ended art center where children can be creative in what they make, choose the art materials they will use, and what they want to create. I believe in letting children follow their own creativity, but it doesn’t hurt to give them suggestions for ways to use the materials, still allowing them to choose what they want to do. Kids might want to make Spring pictures of butterflies and flowers, but they might choose something else not related to Spring at all. Even if they do, it will be interesting for them to use new colors. Find Spring Block Center Ideas here. Add some pastel colored squares of tissue paper. Children can draw an outline of their picture and fill it in with the tissue squares. These work well with glue sticks. 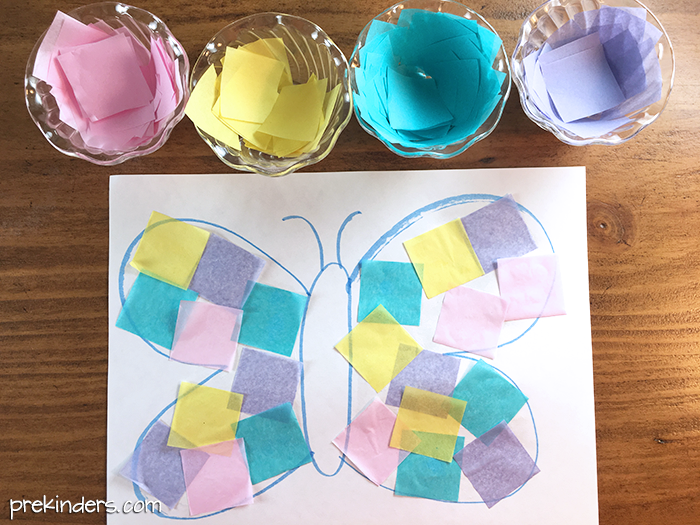 You can show them how to make a butterfly or flower and fill it in with the squares, but I like to give them the choice to use them as they like. Tissue squares can also be crumpled into little balls and glued on. These can be purchased in a pack of pre-cut squares (Hobby Lobby, Oriental Trading) or just buy some colored tissue paper and cut it. Children love to make pictures with sequins and foamies. For Spring, look for foamie shapes, such as flowers, insects, frogs, turtles, etc. Many children will just stick these randomly all over their paper, so I encourage them to make drawings with their stickers. Show them different ways they can draw along with the stickers and sequins by adding grass for the bugs, stems for the flowers, a pond for the turtles and frogs. Because many children tend to go overboard with craft foamies and they cost a little more, I recommend either putting these out for a limited number of days (not everyday) and/or make a poster showing how many pieces children can use per day (or per paper). Tip: Place a mini “trash can” on the table for children to throw away the sticker paper from the back of the craft foamies. You can sometimes find mini trash cans, or use a cup or box. I got these Easter sequins above in a big pack at Hobby Lobby and they were very inexpensive, plus all of their Easter items were 40% off. They have flowers, bunnies, and eggs, and I think they can be used even after Easter. Many foamies work well for Spring. I found insects, frogs and turtles, and flowers. Stencils are fun for kids to use and are great for fine motor. I found these in a craft store. Cupcake papers make cute flower art, or let the kids come up with their own ideas. Cupcake papers come in so many colors and designs. You could even cut them in half or in fourths for kids to use. These are the mini cupcake papers, but you could also use the regular size or both. Crepe paper is a fantastic and inexpensive art material that children love to create with! I keep crepe paper in my art center all year, I just vary the colors by season or holiday. Children sometimes cut small pieces and other times cut longer pieces, and they make all kinds of things with it. Add Spring colored markers and crayons so the children’s pictures will have Spring colors. To get a variety of color hues, I got a pack of 50 Pip Squeak markers. What do you add to your art center in the Fall? Share your ideas in the comments below! Paintbrush clipart by Scrappin Doodles. Thanks so much for all your creative ideas! I love this! Thank you for always providing fresh new ideas! Great ideas. I have cupcake papers that are really colourful. I will certainly add them to my art projects. I love the ideas that you post! Thank you!! I love all your activities it really help me a lot! !